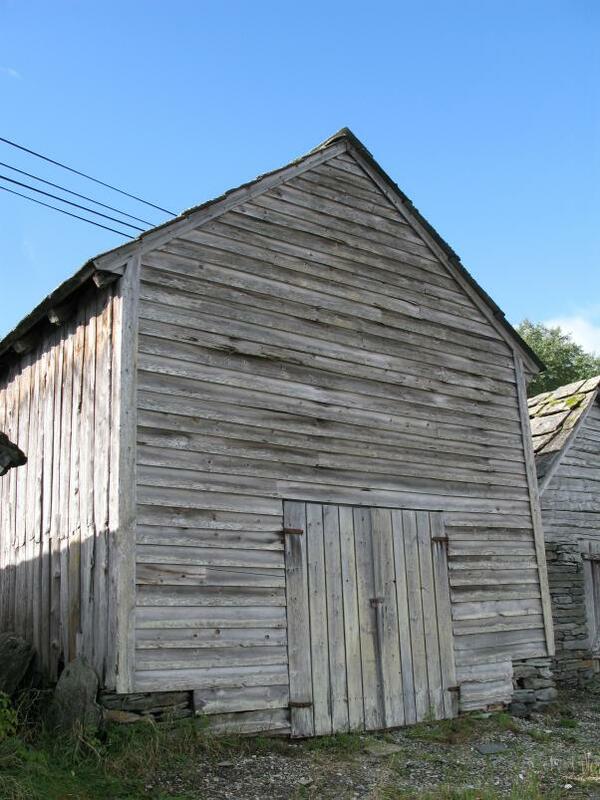 That good old silvery grey of weathered wood is one of the most basic colors when building old wooden buildings. I have just aquired my first bottles of Silverwood stain, and it is every bit as good as people say it is. In my opinion, the more coats you add, the more correct the color gets. But sometimes you want a almost white tone of silvery grey. 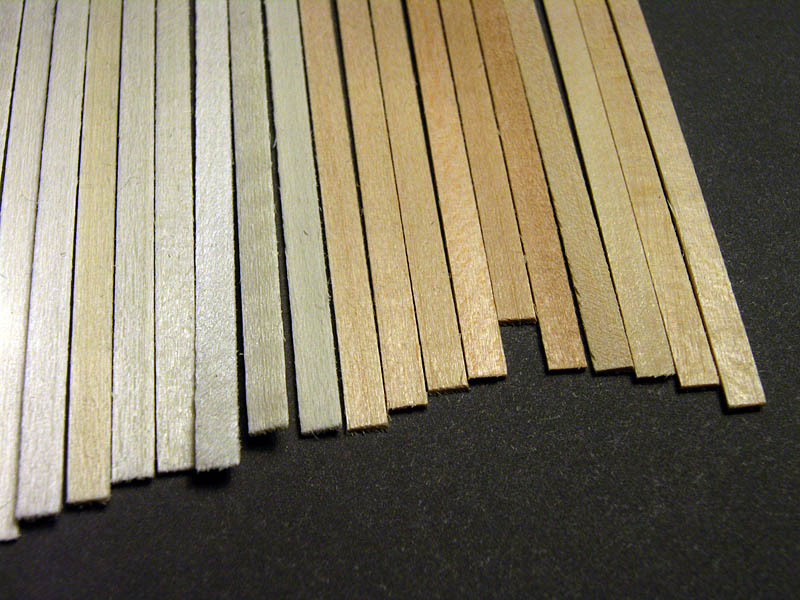 Since the untreated basswood has a distinct yellow tone, it is difficult to achive good, light silvery tones. It recently struck met that maybe the thing is to bleach the wood before you stain it? 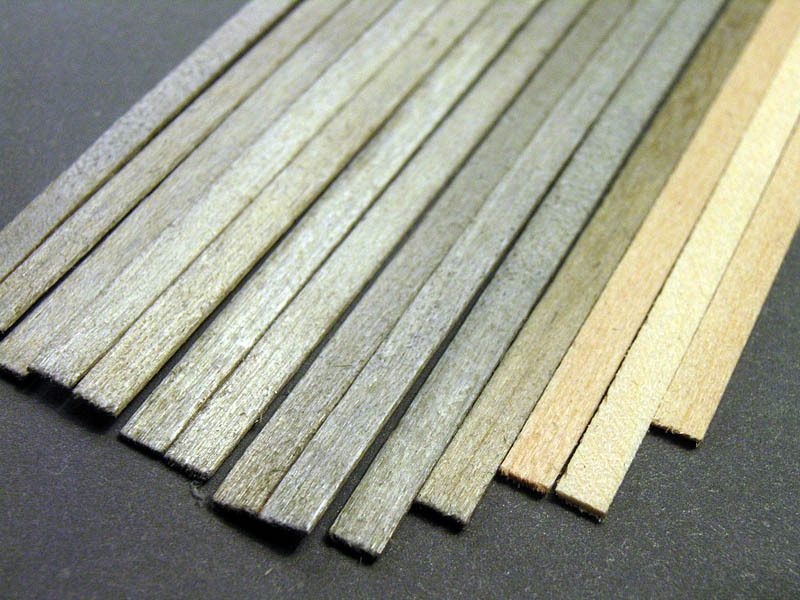 Searching the web I found some recipes for bleaching wood that looked promising. To make a medium length story short, I ended up using 35% hydrogen peroxide combined with a 35% solution of ammonia. First, be warned that we are speaking industrial strength chemicals here, and not something you would hand out in primary schools during craft lessons. Wear heavy duty rubber gloves, protective *closefitting* goggles (those ammonia fumes *really* stings the eyes!). Work in a well-ventilated area with access to lots of fresh water. Work on a surfce than can be washed down with lots of water. Read the datasheets before starting! Start by painting the raw wood with the hydrogen peroxide solution. Be generous, but you dont have to flood it. Wait for the wood to absorb most of it before you stain it with the ammonia solution. Decant a small amount of ammonia in a glass container and recap the ammonia bottle. You don´t want to transfer small amounts of peroxide back into the ammonia bottle. Strange chemical reactions might otherwise happen. First after applying the ammonia the bleaching will start. It starts to work almost immediately. I leave it for a couple of hours before washing the wood with lots of water. Then you just leave the wood to dry. If you use only peroxide, no bleaching takes place. Alone, ammonia hardly leaves a trace. The ammonia acts as an activator for the peroxide. One question. What, if any, effect does the bleach have on the strength of the wood? The reason I ask is that back when I was a spotty yoof a fellow schoolboy experimented with a chemical potion (the details of which I've long since forgotten) to reproduce bleached wood. The result looked very good, but the treatment attacked the structure of the wood and after a short period of time it just crumbled. Needless to say he didn't pursue the idea. Hopefully this doesn't have the same problem, because it looks to be a very useful step forward. This bleach is reccomended (by The Research Council of Norway, no less!) as a remedy against "Blue stain", a bluish or grayish discoloration of sapwood caused by the growth of certain dark-colored fungi on the surface and in the interior of the wood. It is reccomended for use on furniture, with no mention of side-effects like weakening of mechanical strength. They do warn against possibel discoloration of textiles that comes in contact with the treated wood, but this should not be a problem if you rinse the treated wood with plenty of water. Of curse, things could be different with the very small dimensions of stripwood used in modelling. I havent noticed any crumbling, but I will look further into it. Very interestting. the basswood color is something that has bothered me for a long time. I will have to give it a try. Thanks. I tried the bleaching with chlorine bleach a couple of years ago and one thing I noticed is that paints and stains would oftrn re-activate the bleach that stayed in the wood (I didn't rinse it once it was dry....and used it shortly after drying)...this caused them to fade or heavily discolor/lighten over a period of time. This effect could probably have proved useful...but I was not really able to control it. I tried the bleaching with chlorine bleach a couple of years ago and noticed I noticed is that paints and stains would oftrn re-activate the bleach that stayed in the wood (I didn't rinse it once it was dry....and used it shortly after drying)...this caused them to fade or heavily discolor/lighten over a period of time. This effect could probably have proved useful...but I was not really able to control it. I have just recently testet this concept, so the worries expressed in this and another post are of great interest to me. I will look further into the matters, and I think we have to conclude that the technique is experimental at the moment. I look forward to further research into the matter! I have at least a theoretical answer to this potential problem. According to my chemical brother-in-law a 5-10% solution of Natrium bisulphite in water should neutralize the hydrogen peroxide once and for all. Please note that hydrogen peroxide is not the only chemical that is used for bleaching! For instance, household bleach is most likely chloride based, and DO NOT MIX CHLORIDE WITH AMMONIA! THIS CAN RESULT IN POISENOUS CHLORIDE GAS! Be absolutely sure that the bleach you have is Hydrogene Peroxide and not in fact a Chlorine based bleach whwn combining it with ammonia. Please read the datasheets associated with Hydrogen Peroxide, Ammonia and Natrium bisulphite before experimenting with these chemicals. Kids, do try this at home, but be super careful. Wear protective goggles, solid rubbergloves and work in a well-ventilated area. A shop apron is a good idea, spills will ruin your clothes. If I try to buy this stuff here, will I get a call from homeland security? I assume/hope your brother is a chemist...and not a member of the band "The Chemical Brothers"
I was wondering if anybody would catch the little play with words in my post! And my brother in law is indeed a chemist, and not a member of the band CB. I might have caused some confusion by translating "Natrium Bisulfate" in a very poor way. What you should look for is Sodium bisulfate. Household cleaners like Sani-Flush could be used, it contains roughly 45%. But be sure to check that it does not contain unwanted chemicals like Chlorine!! (See earlier post). The point is to reduce the alkalinity in the wood. Without a high PH no bleaching will take place. As a matter of fact, I do not only have chemical broter-in-law, I also have a chemical father with a Phd. in paper chemistry! Hydrogene peroxide is often used to bleach paper (that was what gave me the idea in th first place), so he has some knowledge in these matters. He says that the risk for restarting the bleaching process by paint or stains is close to zero. He is more worried about a reversal of the process, that the wood turns back to yellow in time. But he says that reduce the alkalinity will prevent this. As for weakening the mechanical strength of the wood, he says this is possible in theory, but he would not be concerned about it when using the treated wood for scale models. I gather you live in Norway, how did you get the Silverwood from the US to Norway? Caboose Hobbies is your friend! Very informative and interesting info. Thanks. PS. I am probably one of a few, if not the only, other guy on this forum that would know who the "CB's" are. Had another talk with dad on the subject of bleaching wood. He could confirm that chlorine based bleach attacks the mechanical properties of the wood. So chlorine bleach is a really bad idea for stripwood. He also said that you could use acetic acid (real strong vinegear would work, here in Norway you get 35% acetic acid in grocery stores) as a substitute for the Sodium bisulfate to neutralize the hydrogene peroxide. Might be easier to get hold of. But enough theory, I look forward to hear about actual experiments with bleaching wood peroxide and ammonia! I do. They're boring. Popular among boy racers with over-amplified sound systems, though. I'm not a boy racer (at least not that I know)...but I use them and other sim stuff for my roadbike training rides....base beat and tempos work for cadence.